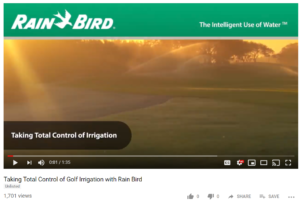 To communicate key Rain Bird differentiators in a market where peer input drives decisions, we created a platform that allowed superintendents from across the country to tell their stories of Rain Bird irrigation success in their own words. This series of testimonial-driven videos highlights a pain point or problem each superintendent faced on their course and how they were able to solve it through their partnership with Rain Bird. We wanted to drive awareness of the innovative products, service and expertise that Rain Bird can offer and position Rain Bird as a partner for golf course superintendents’ needs. Two key insights influenced our approach. First, we recognize superintendents are often in a highly scrutinized, stressful environment. Faced with labor challenges and member/customer expectations, they’re forced to do more with less and budgets are closely examined. An irrigation system is crucially important, but they don’t want to or have the time to think about it. They need to trust in product performance and expect the brand to provide 24/7 support because the system simply has to work as designed and touted. And second, among superintendents, peer word of mouth is a strong influencer in the decision-making process. We strive to build Real Connection™ among our audiences and the brand. And in this case, we felt our message was delivered in the most impactful way coming directly from the mouths of people our audience rely on most – their peers. Authenticity. Golf courses and superintendents have different needs. A manufacturer can provide features, benefits and data to market their products and services, but the best proof points come directly from the positive stories shared by the people actually using them. For every interview, we prepared questions and key themes to highlight, but what stood out was the story diversity told by each superintendent – why they chose Rain Bird and how a product allowed them to overcome a unique challenge. The authenticity of these stories makes this video series an impactful tool to deliver campaign objectives and a successful mouthpiece for advocating the Rain Bird brand.